Simo’s Bread & Catering is in Kingston TODAY! Christmas Gifts Available! Christina Simonitsch of Simo’s Bread and Catering, Montego Bay is in town today! Check her out at Kayter on 18 Ballater Avenue. She will have Christmas gifts available. They will be perfect to give just about anyone you know who will be cooking up a storm this Christmas. Christina not only does specialty Breads and Pastries, but has Gourmet selections and her private label Condiment line of Pepper sauces, Sea salt, Pepper Jelly, Basil Pesto, Jerk Butter, Marinades and more are one of a kind. She makes Honey now too! For some time now, my cousin in Montego Bay told my husband about a young lady that makes extremely delicious Pastries and handcrafted Breads. The young lady she spoke of is Christina Simonitsch. With this kind of recommendation, we both followed her on Instagram immediately. Her Instagram page, @simosbreadandcatering is quite mouth-watering. You can see the joy and passion she has for cooking and baking, leaving you with no choice but to want to be a part of it. The name, Simonitsch is quite known not only in Montego Bay, but islandwide and worldwide. Christina is what we Jamaican folks would like to call ‘good stock’. Her father is Heinz Simonitsch, the Austrian hotelier that arrived on the island to run Half Moon in 1963. Under his stewardship, Halfmoon became one of the most successful privately-owned beach resorts in the world. He retired in 2002 and has been recognized by being awarded with the Honorary Order of Distinction for his lifetime contribution to Tourism in Jamaica and the Caribbean. With his retirement, I am happy to see his name live on in the Culinary industry of Jamaica via his eldest daughter Christina. Christina grew up in the kitchen and it seems as if the passion for what she does is in her DNA. She knew what her career would be from very early and also learnt from her Aunt and Grandmother in Austria. After catering for mostly friends and family at small gatherings, the choice was easy for her to stay and work in Jamaica instead of returning to Europe. Word spread so fast, her hands were full. Christina not only does specialty Breads and Pastries, but has Gourmet selections and her private label Condiment line of Pepper sauces, Sea salt, Pepper Jelly, Basil Pesto, Marinades and more. She is based in Montego Bay, so occasionally, she announces when she will be coming into Kingston and posts her list with prices. She usually comes in on a Thursday, where pick ups can be made at Shams Bakery in The Marketplace between 11am-2pm. I ordered her Basil Pesto the 2nd to last time she came into Kingston because I was too late to order the Cinnamon Buns I have been dying to taste. I made a fabulous Pesto Pasta with Chicken and Shrimp. That Basil Pesto is definitely #sugaendorsed. She came back to Kingston last week Thursday. I made sure my order of Cinnamon Buns and a Cronut was in early this time, especially since there was an occasion to celebrate. My father-in-law got treated with Cinnamon Buns for his birthday and we all enjoyed it. I love that the icing comes separately in a bag if you are watching your calories. After trying Simo’s Bread & Catering’s pastries, watching calories goes out the window. That Vanilla Cream Cheese Frosting I thought I was just going to have a smear of, was a delightful topping for the scrumptious Cinnamon Buns. I sat down in my living room about to have my Cronut thinking to myself, why did I just spend almost a $1000JMD on a cross between a Croissant and a Doughnut? Say no more. I took one bite and it was heavenly. The perfect mix of moist and crispy with a touch of flavoured cream on the inside and a hint of icing on top. A bite turned into quicker bites, then a swallow and I had to stop myself. I knew I needed to savour it. So I decided to distract myself by messaging my husband who missed the opportunity of being home for this pleasurable experience. I told him there is no way I could save a piece for him. Then just like that it was finished. Instead of feeling guilty for indulging in this pastry, I just sat there with a smile on my face like a real pleased puss. It was totally worth it. Well, maybe $500 plus the delivery to Kingston. Regardless, I would order that Cronut again in a heartbeat. 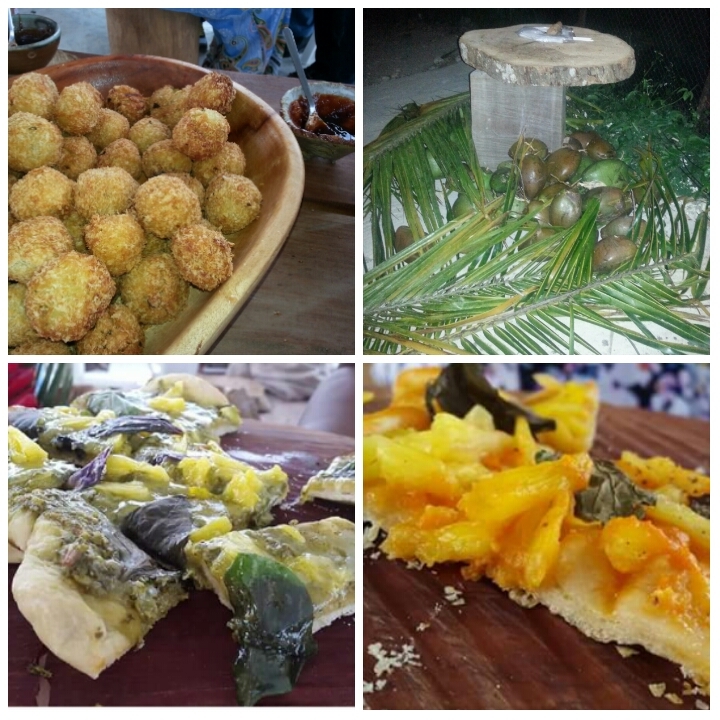 When is Simo’s Bread and Catering’s next trip to Kingston? I have good news. I am not sure when you can make Orders for Pick ups but Christina will be Co-hosting a gathering soon on May 19 at Kayter Restaurant on Ballater Avenue. It should be a gastronomic experience. Make your Reservations! 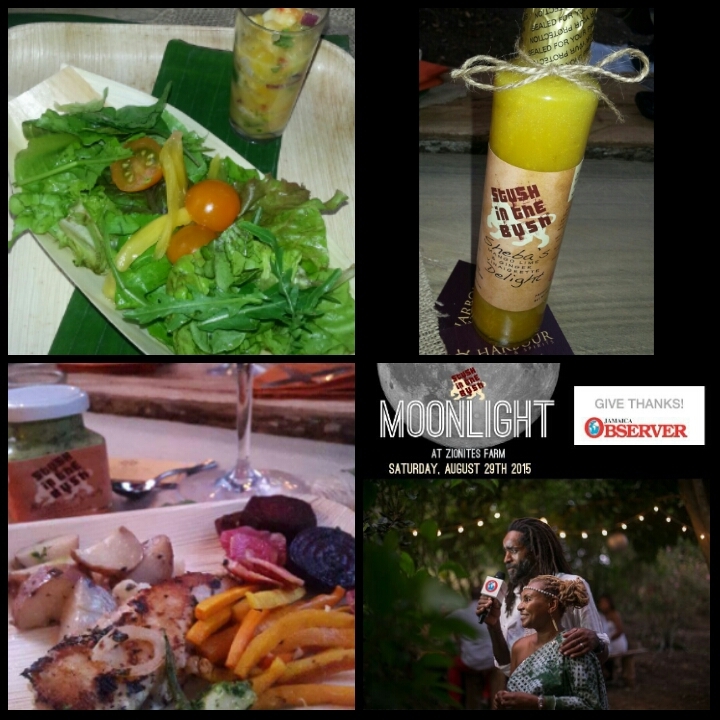 How was Moonlight at Stush in the Bush, St. Ann, Ja?! Now that you are either up to speed, you are already aware of the hidden culinary experience or you are just so curious that you want to read on, I will keep you in suspense no further. Last Saturday I visited Stush in the Bush’s second Moonlight event with friends. The event costed $80USD with limited spaces. As soon as all spaces were filled, a notification was sent out. Before the event, we were updated and teased with emails of the menu, what to wear aka ‘Bush Glam’, a little of what to expect etc., just enough to let you remember the event, be well prepared and to remain enthusiastic about it. The directions given were also detailed to the key so you would not get lost. There was a threat of rains from Hurricane Erika, so on the day we were told to wait it out a little until given more information. The event was to start at 3pm. We got the clear with pictures of bright sunshine a little after 1pm. So my friends and I decided to get ourselves together to make our way out. We got there at 4pm. Only ‘4-wheel drives’ could go directly downhill to the farm, otherwise you would have to park at the top and walk down because it was quite steep and rough. Hence the ‘Bush Glam’ dress code to wear boots, closed foot shoes etc. Upon entry we saw a few people gathered, already nibbling on appetizers. I had no doubt food would be circulated already. Mrs. Lisa Binns is always prepared, on time and seems to be quite a perfectionist. My friends and I were greeted by both Lisa and her husband, Chris on our way in, genuinely warm and pleasant as usual. There was also a welcome sign with our names along with other guests, which I found to be quite creative and hospitable of them. Now to the food! Let me start out by saying that I found everything delicious throughout the evening except for the Potato and Leek soup that was just ‘ok’ and the Robalo (fish) for the main course, which was overcooked. But they had so much going on, food everywhere you turned, as soon as you stopped eating, something else was brought out for you to experience, so those two, yes, literally two items that were not made to perfection, seemed oh so negligible. The Rosemary Beer Bread really had the taste of Red Stripe beer and you could taste the rum in the Rum Guava sauce for the Yam and Pineapple Croquettes! Awesome. We also had access to freshly chopped Coconuts. The Fiyah Grilled Pizza that stood out for me was the Pesto pizza. Delish! As the majority of guests arrived to the lovely venue with a spectacular view, we were given an official welcome by Lisa followed by Chris. She gave many thanks to her guests for coming, especially returnees and important guests to her such as Anna-Kay Tomlinson aka Miss T from Miss T’s Kitchen, who continuously encouraged Lisa from the very beginning and Chef Conroy Arnold from Hermosa Cove who also loves to use their products, especially their fresh, local greens from the farm. Their farm, called Zionites farm, had a nice ambience and was quite cool. We were also reminded that the first ingredient of their products are Love and Affection, sometimes hard to come by, said Chris. However, their love story is quite sweet and it is obvious they continue to care, love and support each other throughout their lives, especially at the toughest times such as the passing of their mothers. Imagine, when Chris met Lisa, her mother died 5 days after. He could either step up or run. He said he did a bit of both but he made sure he found himself on that plane to Barbados to meet the family and go to the funeral. Quite a task. But he made it happen. They thanked The Jamaica Observer, who of course has been there from the very start and other persons who helped with the event to make it even more dynamic such as Select Brands, Grace Kennedy for the Harbour wines and spirits, Gina May Mair from Fresh Monger JA (known for wild caught, premium seafood) for the Ceviche and fresh, local fish and Sasha Palmer, CEO of Liqy Liqy who provided popsicles for part of dessert. It was nice to see the support given on both sides for Moonlight and each other’s products, even leading up to the event. What was even nicer to know, when they thanked their staff, we learnt it comprised of people they trained from within their community. Lisa mentioned she would also like to start a Young Women’s group for young ladies leaving school with no jobs and young mothers, creating even more opportunities for persons in the community. A nursery on property for their young ones to be monitored and in a safe place while they work is in the plans too. Also, cooking classes for them and us folks, that has already been a frequent request. That was an inspiring mouthful that had everyone’s close attention, as Lisa is always so eloquent and Chris adds his quiet touch of humour. We moved on to have fun at the Selfie station where an actual selfie stick was provided. Ha! Finally learnt how to use one. We then gathered by a huge fig tree and joined hands, a place of meditation for Chris. For the main course, we walked down the love path made by arched plants and trees and sat on benches by tables that held at least 10 people. 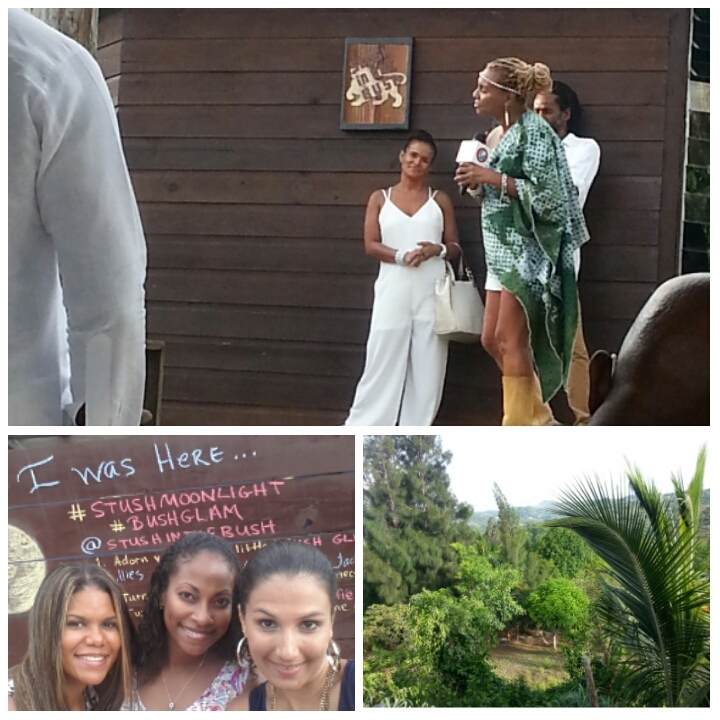 So it was a homey atmosphere that facilitated socializing and even a little networking. 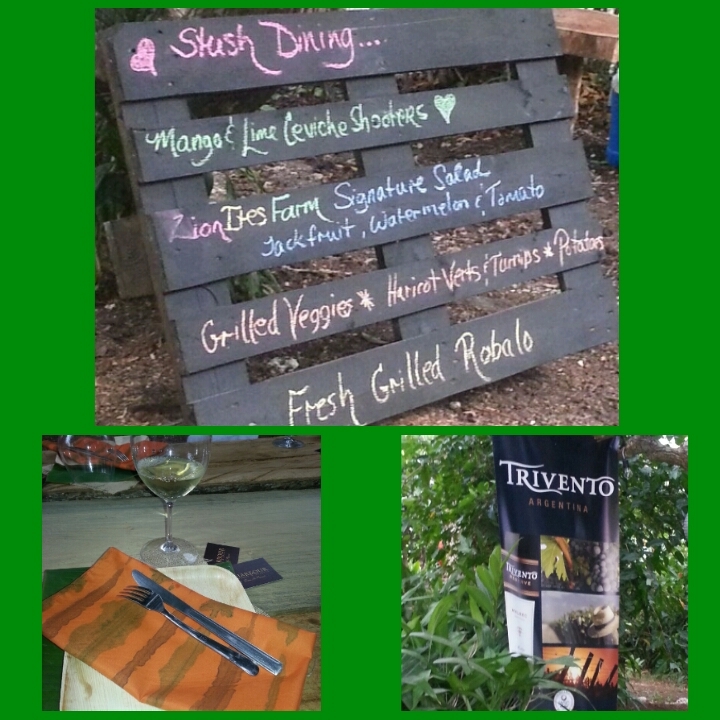 The Mango & Lime Ceviche shooter and Zionites Farm signature salad including Arugula, Microgreens, Jackfruit, Watermelon and Tomatoes along with a choice of Mango lime & ginger vinaigrette was fantastic. 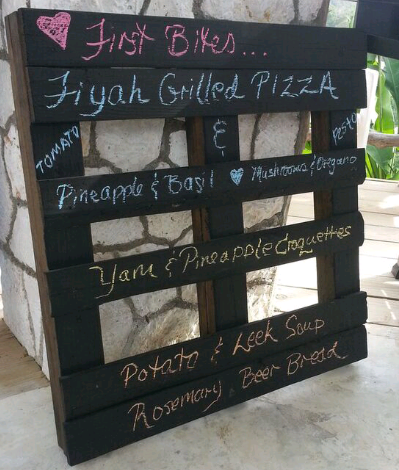 Their Blow Fyah sauce in small doses of course, went well with the Robalo and grilled veggies. We had the pleasure of sitting with Ms. Sasha Palmer, founder and CEO of Liqy Liqy based in Manchester, who also won the Business Journalists’ award at Jamaica Observer’s Mogul in the Making Ceremony this year. She had such a lovely personality. Certainly a pleasure conversing with her. She is quite passionate about what she does even though it is her side business. She also offers opportunities to persons within her community in Mandeville by employing single mothers to make the popsicles and run the Liqy Liqy carts at events. She was excited to share that they cater popsicle treats in all sizes, shapes and forms for Bachelorette parties and other events. Wink wink. From what I remember that night, she had the flavours of Mango, Lemon and Basil, Tamarind and Coconut. The Vanilla flavour made its debut and it was delicious like Devon House Ice Cream, BUT all the popsicles are 100% organic and low in calories. For the others that I had, the Lemon and Basil popsicles were refreshing and good palette cleansers and the Coconut was tasty as well. 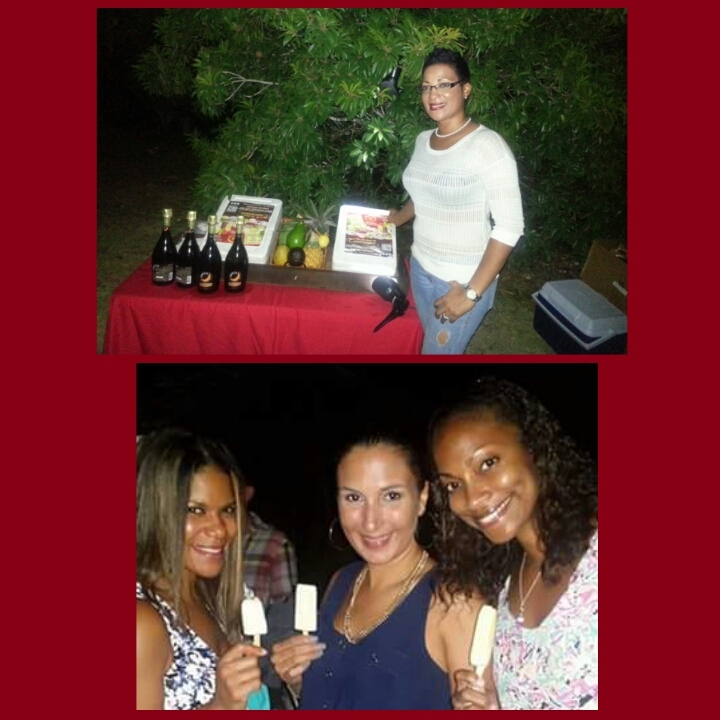 Liqy Liqy’s gourmet popsicles should be on the shelves soon, if they aren’t already, at supermarkets such as Loshusan, John R Wong and all the Sugar & Spice locations. Look out for their Sorbets coming soon too. Follow them @LiqyLiqy on Instagram and Facebook. The bonfire had begun and we made our way back up to where we gathered at the beginning to be greeted by Ginger cookies topped with Lemon Curd. For those watching their weight, the whole day was practically guilt free until I was presented with extremely salivating Dessert pizza with Banana, Chocolate, Peanut butter and more. Even though it was practically all Vegan, it was the winning dessert for me! 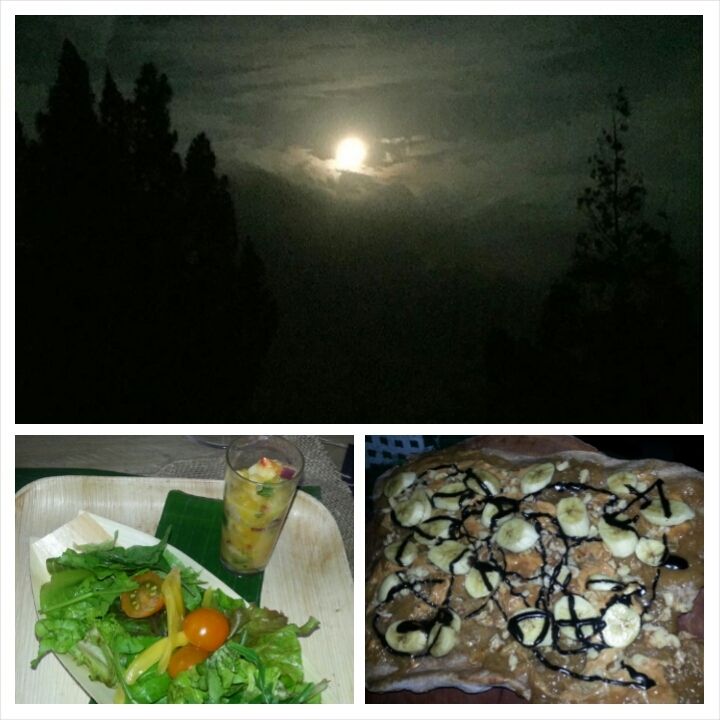 Another Dessert pizza with Jackfruit also came out and that grill kept firing up more. I thought all of that created fireworks in my stomach, only to hear real fireworks behind me. What a pleasant surprise! They definitely went all out. Only one person in the crew checked the time so we wouldn’t get carried away into the night there. Wine was still flowing, sauces and spreads were on sale and it seemed like we missed the after party on the dance floor. It was just after 8pm, the time at which Moonlight was scheduled to be finished. So definitely not a typical Jamaican event, as it had an on-time start and finish. We appreciated that they were considerate of our time, allowing us to get back into town at a reasonable hour. Wow, what a delightful evening that left everyone impressed and fully satisfied. A refreshing experience that freed the mind, both an inner and outer body experience in a sophisticated-rustic atmosphere. They prepared and catered to the vegans, vegetarians, those who couldn’t eat pineapples, all with allergies, those who had to eat gluten-free, you name it. Well done Chris, Lisa and all the others that came together to make it happen. So what else is on the horizon for Stush in the Bush? A possible Bed and Breakfast, a Yoga platform around the huge fig tree, where a bonfire was lit for the night and an outpost on another Caribbean island. Suga cannot wait to return with even more friends and family! Which bush brings out the stush?! Nestled in Free Hill, Bamboo St. Ann you will find it. 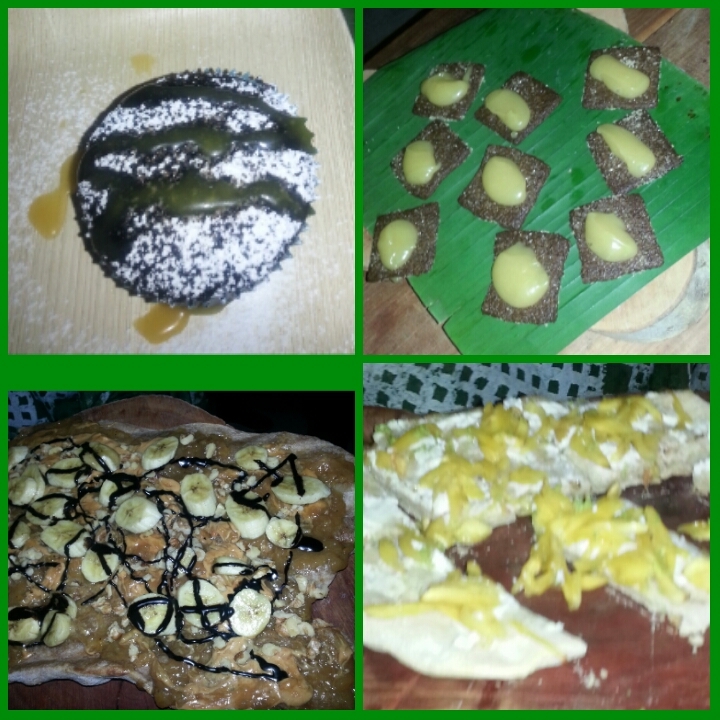 An Organic Farm, a Vegan and Vegetarian Restaurant, Tours and Sightseeing all in one! I am yet to visit the farm but I have tasted some of their products and been privileged to hear from the vibrant and eloquent, Lisa Binns, the lady in charge on the farm, as well as her husband, Chris, a bit on the quiet side but still brings a lot of personality to the table. They produce sauces, preserves, dressings, breads and organic veggies. 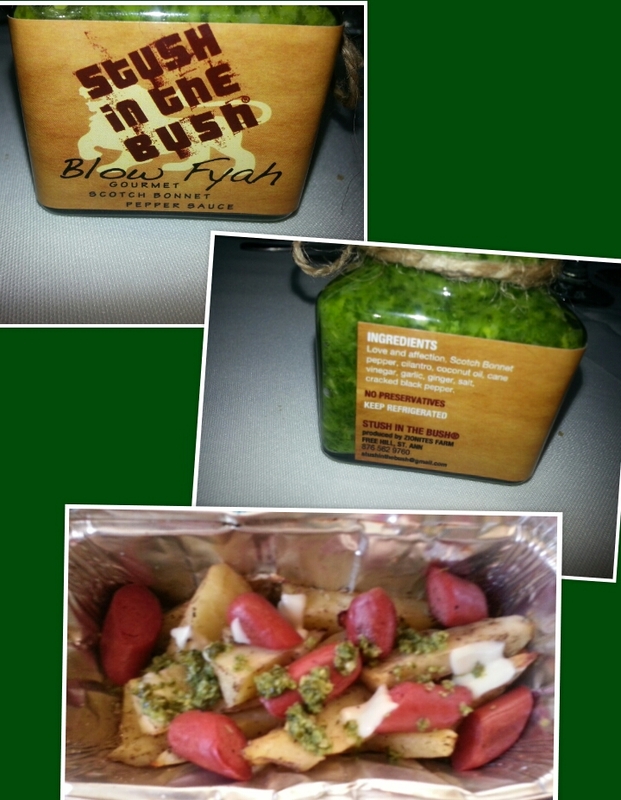 I had the pleasure of tasting their Vegan Basil Pesto, Chimichurri Sauce, Sweetie Cherry Tomato Marmalade, Limited Edition Lemon Curd and their Blow Fyah pepper sauce. The Blow Fyah pepper sauce blew my mind. The Lemon Curd was decent, but everything else was certainly delightful. The Vegan Basil Pesto with arugula on pizza is a good combination. Their Chimichurri Sauce complemented fried green seasoned plantain chips well and it has been recommended to add it to steak and pork chops. The Sweetie Cherry Tomato Marmalade and Blow Fyah pepper sauce can be eaten with just about everything. For instance, the Marmalade can be eaten on burgers and cheese on bread, while I tried the Blow Fyah sauce with roasted potatoes and grilled chicken sausages topped with cheese and tomatoes. I had some water close by to cool me down a bit because it really was ‘fyah’ but so tasty and rich in flavourful herbs and spices. Stush in the Bush is surely on a growing path and may one day even be a Bed and Breakfast. They are Observer Food Awards’ nominees for Best New Food Item and Best Producer. Good luck to them. Visit their Facebook page, STUSH in the BUSH for more information and for booking tours and lunch. Their products can currently be found at CPJ Market in Courtyard 71 and Uncorked in Sovereign North.